This is the complete text of Chapter XXIII of Poltergeist Over England (Country Life, 1945) which describes the stigmatic phenomena which Eleonore Zugun displayed on her visit to the National Laboratory of Psychical Research in the autumn of 1926. ﻿I have not yet been able to make up my mind which of the two classes of Eleonore's phenomena, the telekinetic or stigmatic, were the more convincing. The stigmatic marks and abrasions which spontaneously appeared on various portions of Eleonore's body were, as I have remarked, the most interesting of the phenomena said to occur with this medium. I saw several of them during the periods I kept the girl under observation. The marks were of several varieties, including teeth-marks, long scratches, oval, annular, elliptical, and other marks of varying shapes. The teeth-marks, it must be admitted, were similar to those made by Eleonore's own teeth; arid tests carried out proved that if Eleonore bit her own arm, identical impressions to those alleged to be abnormal were found, except that the number of teeth indentations varied. But no one saw Eleonore play tricks of this description, although she was kept under observation for days by different investigators. Teeth-marks were never found on any part of her body not accessible to the medium's mouth; they invariably appeared on her arms or hands. This applied also to the scratches and other markings which appeared on her chest, arms, wrists and hands. But she was never caught making these marks, some of which must have been exceedingly painful. The marks were always sore afterwards. And pins and needles in her proximity would suddenly appear in her flesh. During my investigation of the girl in Vienna, in May 1926, and later in London, as related in the last chapter, these stigmatic markings occurred very frequently. At Vienna during the first few minutes of my preliminary observational period, Eleonore gave a short, sharp cry of pain and Countess Wassilko at once pulled up the left sleeve of the child's bodice, and on the fleshy part of the forearm, some distance above the wrist, were the deep indentations of teeth-marks, six above and five below, forming together an elliptical figure. If the reader will bite the fleshy part of his own arm, he will get an exact representation of what we saw. The length of the ellipse was 40 mm., the width 20 mm. If the marks were produced by an actual mouth, the width of the ellipse would depend obviously on how much flesh was gripped by the teeth. Though the markings could have been made by the girl herself, I did not see any suspicious move on the part of Eleonore. In London we proved that at least some of the stigmata could not have been produced normally. Well, during the first stigmatic phenomenon I watched the indentations on her arm gradually 'fill up', turn red, then white, and finally rise above the surface of the flesh in the form of weals. I examined the sleeve of her bodice for marks of saliva, because if the girl had bitten her own arm, she must have done it through her sleeve. But there was no sign of moisture. The weals became gradually less distinct. 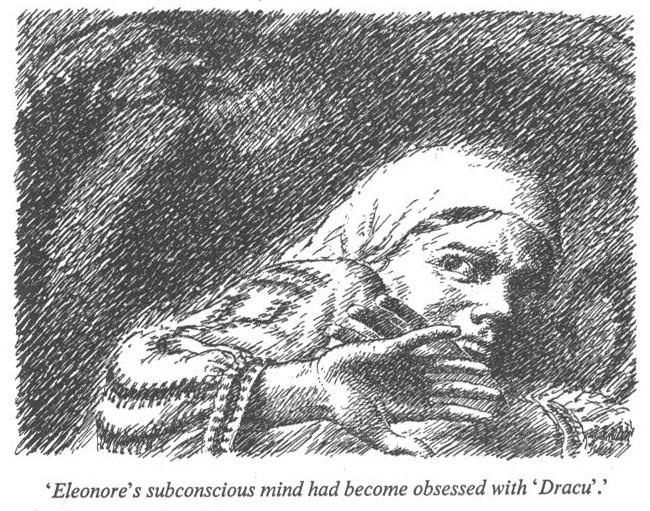 Eleonore was convinced that 'Dracu', her 'devil', had bitten her. Later during the same afternoon, Eleonore gave another cry of pain, and upon examination we again found another set of teeth-marks on the girl's arm, quite near the previous bite. Four indentations formed the upper portion of the ellipse, and five the lower. The bite was the same size as the previous one. The girl was standing by my side during the appearance of the weals, and there was no suspicious movement on her part. About ten minutes later, Eleonore gave another cry of pain and pointed to her chest. The Countess at once untied the ribbon that fastened her frock and pulled down her camisole. Between her breasts, and extending a little on to her left breast, were seven scratches in two series of four and three, in the form of a criss-cross. The scratches averaged between six and seven inches in length. As we watched them they gradually turned red, then white, and in a minute or so became hard, white weals. It might have been possible for the girl to have made the scratches herself, especially as she had just left the room for a moment. But her cry of pain was so real, and the condition of the abrasions appeared so fresh, that the theory of self-infliction becomes less tenable. Also, the girl could hardly have had time to undo her frock, make the scratches, and adjust her clothing again. That the scratches had appeared only at the moment of the girl's cry was quite evident from the rapid way they changed before our eyes into the usual hard, white weals. That the stigmata were associated with some mental process, was proved by the fact that, after every phenomenon, telekinetic or stigmatic, the girl's pulse-rate-increased. Her normal rate was 75 beats to the minute. Immediately after a phenomenon it rose to 95 beats. But there was no other indication of the girl's reaction except an occasional slight trembling. She appeared perfectly normal after each bite or scratch. During my stay in Vienna, I saw scores of these stigmatic markings. All were spontaneous and there were many variations of size and design. One mark was in the form of a pair of nutcrackers. I could not help wondering if 'Dracu', whether a real entity or a subconscious creation of Eleonore's, would survive the journey to London and the cold light of scientific investigation. As the reader knows, the telekinetic phenomena we witnessed at my laboratory were good. The stigmata were not only good, but even more convincing than those I had witnessed in Vienna, as they occurred under much better conditions of control. 'An example of the stigmatic manifestation occurred yesterday morning in my presence. Soon after I entered the room a mark was noticed rapidly growing on the girl's arm. As I watched it it grew into a number of cruel-looking weals which might have been inflicted by a whip or a thin cane. I am satisfied that neither the girl nor anyone else could have inflicted any such blow. Within a few minutes the marks had disappeared. Some minutes later, while I was helping Eleonore to wind up a clockwork cat, of which she is inordinately fond, I myself saw similar weals beginning to appear on her other arm and at the back of her neck. 1. In the Blatter aus Prevorst, Vol. V, pp. 171 ff., is an account of a Poltergeist in the house of Prof. Schupart, whose wife was 'bitten, pinched, and knocked down' by the entity. 2. Morning Post, October 4,1926. 3.20 p.m. Eleonore cried out. Showed marks on 'back of left hand like teeth-marks which afterwards developed into deep weals. I got Eleonore to bite her right hand and noted the kind of marks caused by this bite, but could trace no similarity between this and the first alleged stigmata. 3.25. Eleonore gave a soft cry and pointed to her right wrist. She undid the sleeve of her blouse and rolled it up. I saw some freshly made red marks like scratches. There were several of these, about five inches long. After a few minutes they rose up into heavy white weals. 4.12. Eleonore was just raising a cup of tea to her lips, but suddenly gave a cry and put the cup down hastily; there was a mark on her right hand similar to those caused by a bite. Both rows of teeth were indicated. 4.15. Eleonore again raising cup of tea to her lips when she gave a cry. There immediately appeared three long weals extending from the centre of her forehead right down the right cheek. Each was about ten inches long. Eleonore gave every sign of pain. I can state that for several minutes her hands had not been near her head or face. 'It may be only coincidence but, at any rate, it happened yesterday that these phenomena came thick and fast only when I turned up with another offering in the form of a toy. We were having tea in the laboratory and Eleonore was in the act of raising her cup to her lips when she suddenly gave a little cry of pain, put down her cup and rolled up her sleeve. On her forearm I then saw what appeared to be the marks of teeth indented deeply in the flesh, as if she or someone else had fiercely bitten her arm. The marks turned from red to white and finally took the form of white raised weals. They gradually faded, but were still noticeable after an hour or so. 1. Daily News, October 5, 1926. 'I was present on October 5 when the so-called "stigmatic" markings appeared on the face, arms, and forehead of Eleonore Zugun under conditions which absolutely precluded the possibility of Eleonore producing them by scratching or other normal means. The marks were photographed in my presence. ﻿1. Daily News, October 6, 1926. 2. In the Phelps Poltergeist case (1851-52) one of the girls concerned was pinched paranormally. Thursday, October 7. Eleonore was kept under strict observation from 10.30 in the morning. At 2.45 a long weal, extending from left ear to mouth, slowly developed. I at once photographed the girl. Later in the afternoon the following members of the Council of the National Laboratory of Psychical Research. and others assembled to keep the girl under observation: Dr. R. J. Tillyard, F. R.S., Dr. R. Fielding-QuId, Dr. A. L. Urquhart, Colonel W. W. Hardwick, Mr. W. R. Bousfield, K.C., F.R.S., and myself. Among the visitors were Professor William McDougall, F.R.S., of Harvard University, and Dr. Thea. B. Hyslop, late Chief of Bethlehem Hospital, the London mental asylum. Dr. Hyslop examined the girl and scratched her forearm on one of the spots on which the stigmata often appear. The resultant weal was indistinguishable from those arising spontaneously. Soon after, at 4.46, two weals appeared simultaneously on her right arm, and later two small ones on the left cheek. In Vienna Countess Wassilko frequently hypnotised the girl, and suggested to her that certain marks - usually letters - should appear on various parts of the arms. These experiments were often successful. It was decided among the medical members of our Council that this afternoon, the events of which I am relating, would be propitious for some similar experiments. Eleonore was accordingly placed on the special settee designed for the purpose, and the Countess then endeavoured to put her into a hypnotic sleep. It is doubtful if the girl went under complete control; I think the presence of so many strangers somewhat excited her. While she was under this partial control the Countess suggested that the letter 'G' should appear on her right forearm ten minutes after she 'awoke'. Some faint marks appeared after a few minutes, but it required some imagination to construe them into the suggested letter. After the Countess's experiment Professor McDougall stated that he would like to try his skill in hypnotising the girl - who thoroughly entered into the spirit of the experiment. So Eleonore was once more placed on the settee, and for about fifteen minutes Professor McDougall exercised his skill in putting the child to sleep. Eleonore became very drowsy, but did not completely succumb to the Professor's efforts to put her into the trance state. He 'suggested' that five minutes after she became normal the letter 'B' should appear on her arm, but no signs of a letter were visible at the prescribed period. Professor McDougall stated that Eleonore was a very difficult subject and that it would require a considerable number of experiments to make her quickly react to his influence. These experiments in post-hypnosis were interesting, but not very successful. ject to stigmata, I believe that Eleonore is the only medium who has produced such phenomena. There can be little doubt that the infliction is a psychological one, and must not be confused with urticaria, a disease of the skin characterised by evanescent rounded elevations resembling weals raised by a whip, attended by intense itching when the skin is knocked or rubbed. Eleonore's stigmata did not itch. And in urticarial subjects, the weals do not appear spontaneously, as in the case of Eleonore's markings. There is a curious belief that those who suffer from urticaria have a layer of skin too few! Mr. Browne (who did not see Eleonore during her visit) was quite correct in his hypothesis that the telekinetic phenomena occurred more frequently when the girl was in motion; also, that the 'stigmata' appeared usually when the girl was quiescent. My own experiences with the girl fully confirm this theory. 1. The famous French psychologist.-H.P. ﻿experiments. But the stigmata - and all her phenomena - ceased very I abruptly, as the reader will learn in the next chapter. It is difficult to estimate which were the more interesting phenomena, the telekinetic or stigmatic. For centuries visionaries and ecstatics have been - as they imagine - singled out by the Almighty as worthy of bearing replicas of Christ's wounds in the form of the stigma of the crown of thorns or the nails. I believe that up to the year 1894, no fewer than 321 saints received these peculiar marks of God's favour. The first good case is that of St. Francis of Assisi; the latest, Padre Pio of Foggia, who is still living. One of the most, if not the most, interesting cases of what I will call ecstatic stigmatisation occurring in modern times is that of Louise Lateau (1850-83) a Belgian peasant, who, like Eleonore, attained notoriety (1868) on account of her presenting the appearance at periodic intervals of stigmata, or marks on the skin similar to those on the body of our Lord -a condition known to physiologists as 'stigmatic neuropathy'. Periodic bleeding of the stigmata every Friday was a feature of Louise's case, which is worth studying. (2) The case was verified by the Belgian Academy of Medicine. An interesting case was also reported (3) by Fr. Herbert Thurston, S.J. The purely pathological cases of stigmatization which undoubtedly are due to a form of hysteria are as interesting as those recorded above. ﻿1. Morning Post, October 20, 1926. 2. "See Dr. Warlomont's Rapport médical sur la Stigmatisée, 187S; E. Lefébure's Louise Lateau - A Medical Study (trans. ); Macmillan's Magazine Vol. XXIII, 1871, pp.488 ff; Dublin Review, 1871, p.170. 3. Proceedings, S.P.R., Vol. XXXII, 1922. ﻿Well-known cases include the production of cruciform marks by suggestion, (l) and the case of ‘Ilma S.’ (2) (1888) in which blisters, red patches, burns, etc., were produced by suggestion. Then we have the experiments of Dr. Pierre Janet who produced red marks by means of imaginary mustard plasters. (3) Experiments have shown that in some subjects red marks could be produced by suggesting that drops of water were burning sealing wax. Dr. J. Rybolkin produced blisters on a subject by 'burning' at an unlighted stove (4) and many other cases have been recorded where the potent power of suggestion on suitable subjects has been responsible for hemorrhage, bleeding stigmata, etc. Most large hospitals have investigated cases of alleged stigmatisation. Within the limits of this chapter I have been unable to do more than touch the fringe of this fascinating subject. 1. Three cases. Dr. Biggs of Lima. Journal, S.P.R., Vol. III, page 100. 2. Dr. R. von Kraffi-Ebing, An Experimental Study in Hypnosis, London, 1889. 3. See l'Automatisme Psychologique, Paris, 1889, p.166. 4. Revue de l'Hypnotisme, Paris, June, 1890.